Toronto’s famed ‘Mink Mile’, representing a portion of the Bloor Street West roughly between Yonge Street to the east and Avenue Road to the west, is seeing substantial changes with significant new construction and new retailers changing the face of the area. New development is having something of a ‘snowball effect’ in the neighbourhood, including new commercial buildings as well as the addition of thousands of new residents — retailers are now said to be looking at the area with fresh eyes. The Mink Mile is home to some of Canada’s most prestigious retailers including the flagship locations for Holt Renfrew and Harry Rosen. It’s the only area in the city to have a dedicated expanse of granite sidewalks, which elevates the street beyond that of a typical Toronto neighbourhood. This article will update some of the things happening at what some consider to be Canada’s answer to New York City’s Fifth Avenue. Consensus among brokers is that Bloor Street is transitioning to become an address for large major brand retailers with a mix of luxury brands as well as some popular national and international brands. The ‘tour’ will begin at the Yonge Street and Bloor Street West crossroads, and will head westward towards the Avenue Road intersection which is anchored by the Royal Ontario Museum and the Park Hyatt Hotel, which is seeing an overhaul. The Yonge and Bloor intersection, located above Toronto’s busiest subway stations, has seen considerable changes over the past couple of years. The 1 Bloor Street East retail podium, which was acquired by First Capital Realty in August of 2016, now houses Canada’s flagship Nordstrom Rack store right at the corner in a 38,600 square foot two level retail space. A Mark McEwan grocery store is under construction and will open in a few months — the duo behind DWSV Remax Ultimate Realty Inc., David Wedemire and Stay Vyriotes, acted on behalf of the retailer and have been key brokers for luxury retailers in the area. First Capital Reality is leasing out more retail spaces in the complex. Developer Sam Mizrahi’s ‘The One’ is now under construction at 1 Bloor Street West and when it’s done, the complex will include a multi-level retail podium as well as a boutique hotel (Costar says Hyatt brand Andaz is negotiating) and a luxury residential tower that will soar to a height of more than 1,000 feet above the street. The same Costar article notes that Apple is said to have leased the corner anchor space with plans to open a multi-level flagship of about 20,000 square feet, though neither the retailer nor Mizrahi Developments will go on the record to confirm. Above the anchor space will be a retail concept which will be discussed at a later date. At the northwest corner of the Yonge and Bloor intersection, Kingsett Capital will be updating the retail podium of 2 Bloor Street West/Cumberland Terrace, with details to be released at a later date. Across Mayfair Mews from 2 Bloor is the construction of an expanded Aritzia flagship, which will span about 11,440 square feet when it opens next year. Dianne Lemm of Northwest Atlantic handled the deal on behalf of Aritzia with the Holt Renfrew Centre’s landlord Morguard. Ms. Lemm says she thinks within the next five years Bloor Street will be a ’world class’ retail destination that will house a mix of luxury and major-brand stores in flagship-sized retail spaces — a sentiment shared amongst several brokers we spoke to. Morguard’s Holt Renfrew Centre and adjacent 60 Bloor Street West office tower will be seeing some significant changes over the next couple of years. The 190,000 square foot Holt Renfrew store which anchors much of the Holt Renfrew Centre at 50 Bloor Street West is seeing a significant renovation which will include updated interiors (with several new and luxury boutiques), a new facade to replace the existing white marble, and the re-introduction of menswear to the main store. Holt Renfrew opened a standalone men’s store at 100 Bloor Street West in the fall of 2014 and it recently announced that it will be moving menswear back to 50 Bloor. The 60 Bloor Street West office tower, which includes a three-level Gap flagship store at the corner of Bloor and Bay Streets, is seeing some updates that will include a new facade. A 3,800 square foot retail space at the base of the tower, adjacent to the recently opened Saint Laurent street front boutique at Holt Renfrew, is available for lease by landlord Morguard. On the south side of Bloor Street at the corner of Balmuto Street, a roughly 3,000 square foot retail space at 19 Bloor Street West is currently available for lease. Arlin Markowitz of CBRE explained that it is a terrific space for a variety of potential retailers — Mr. Markowitz’s team sold the building a couple of years ago for $74-million and Scotiabank intends on continuing to lease space in the building. Mr. Markowitz explained that the surrounding changes, including renovations to Holt Renfrew and the Manulife Centre, are generating considerable interest for the 19 Bloor Street property as well as the area in general. The Manulife Centre at 55 Bloor Street West is seeing a transformation that is adding retail space in an expanded podium that will soon house Canada’s first Eataly (spanning about 50,000 square feet over three floors) as well as a new location for Over the Rainbow Jeans, and an updated Birks jewellery store which will feature street-front facades for Breitling, Van Cleef & Arpels and Cartier. These luxury boutiques, as well as the Saint Laurent boutique at street level at Holt Renfrew, add an element of luxury in an area which also houses more affordable brands such as Zara (which recently renovated) and H&M. A large corner retail space at the corner of Bloor and Balmuto Streets is available, as well as some retail spaces inside the Manulife Centre complex, and brokerage/consultancy Beauleigh is handling the leasing there. Crossing Bay Street on the north side of Bloor Street is David’s Footwear, which is considered to be one of the most prestigious shoe retailers not only in Canada, but globally. The award-winning store is expanding into the adjacent former Capezio space — David’s recently shuttered its Capezio chain as part of a brand repositioning in partnership with Harry Rosen, with Larry Rosen now acting as CEO for both retailers. Watch for David’s to become a national brand with its first location outside of Toronto to open this fall at Ottawa’s CF Rideau Centre. The current office tower at 80 Bloor Street West, which houses Roots and a Banana Republic store, is proposed to be demolished to be replaced with a 66-storey tower above a 50,000 square foot retail podium. It’s unclear when or if this proposed project might get off the ground and there’s likely no hurry, given that the site houses an income-producing office tower with retail tenants. Next door at 82 Bloor Street West, Harry Rosen’s 55,000 square foot flagship continues to see ongoing renovations, including the addition of several impressive branded luxury boutiques over the store’s four levels of retail. In the winter we profiled newly updated second floor which houses luxury boutiques such as Loro Piana, Zegna, Moncler and Brunello Cucinelli, and the store’s Tom Ford shop-in-store is also in line for a renovation. CEO Larry Rosen explained that the Bloor Street Harry Rosen Tom Ford shop competes with Bergdorf Goodman in New York City and Harrod’s in London for top shops-in-store sales globally. On the south side of Bloor Street across from Harry Rosen, a large Hugo Boss store at 83 Bloor Street West will become available when the store closes this year, and CBRE is listing the building as it seeks a new tenant. CBRE is also selling the three-level COS building next door at 85 Bloor Street West, with owner RioCan looking to divest that particular asset. The stretch of stores beside COS on Bloor Street’s south side has seen a few changes over the past year. European jeweller APM Monaco opened its first Canadian store last year (Jordan Karp of Savills Canada represented the retailer and says that he’s bullish on Bloor as well as the Yorkville area generally) and two doors down is Canada’s first MCM store (CBRE’s Arlin Markowitz, Alex Edmison and Jackson Turner acted on behalf of the retailer). Looking to the north side of Bloor Street across Bellair Street from Harry Rosen is the 100 Bloor retail podium. It’s considered to be one of the most important retail addresses in Canada and as such, Hermes opened its Canadian flagship there in November of 2017 and this fall, a Harry Rosen-operated Ermenegildo Zegna flagship will open next to it (Arlin Markowitz of CBRE negotiated both transactions). Holt Renfrew currently operates a 16,500 square foot men’s store at the corner of Bloor Street and Bellair Street, and the space is currently for sublease. 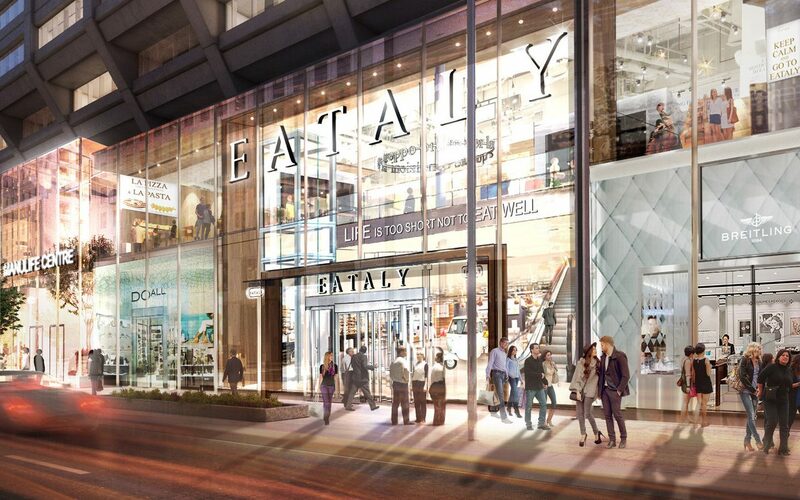 Barry’s Bootcamp will open its second Toronto location at the rear end of the 100 Bloor podium, and the remainder of the Bfloor Street frontage west of the new Zegna store is available for lease. 100 Bloor Street West is such an important address that we’ll be dedicating a feature article about it soon. At 102 Bloor Street West, beauty retailer L’Occitane en Provence recently renovated its store. The building next to that is 110 Bloor Street West, which houses what is said to be one of the top-performing Winners/HomeSense locations in the entire company. Further down at 130 Bloor Street West, a Gucci flagship will see an expansion and renovation next year, and the former Hermes space next to Gucci, which now features 2,500 square feet of space, is available for lease by CBRE. Across the street at 131 Bloor Street West is Morguard-owned ‘The Colonnade’, which was Canada’s first mixed-use building when it opened in 1963. Some consider it to be the most prestigious retail address in Canada, which is one of the reasons why Christian Dior leased a 13,400 square foot two-level space which will become its largest store in North America when it opens in several months time (Dianne Lemm,of Northwest Atlantic, negotiated the Dior lease deal in partnership with Hanna Struever of California-based Retail Portfolio Solutions, Morguard is the landlord). The Colonnade includes retailers Coach, Mulberry and Prada, the latter which recently completed an expansion and renovation to its store which now spans 13,630 square feet over two floors. William Ashley, which recently unveiled a beautiful new store at The Colonnade, relocated from the Manulife Centre where it had operated for years. Last fall, Moncler opened at The Colonnade and there are three retail spaces available. To the west of The Colonnade is the 151 Bloor Street West building, which houses Max Mara, Stuart Weitzman and a Montblanc boutique which was recently renovated to reflect the luxury brand’s newest concept. A retail space next to Montblanc is available for lease (listed by CBRE). Next to Montblanc is Club Monaco, which operates a large two-level store in a heritage building owned by the University of Toronto, and is currently under tarp for a facade refresh. That takes us to the corner of Bloor Street West and Avenue Road, which is anchored by the Church of the Redeemer on the corner, and an 18,000 square foot Louis Vuitton Maison is next to it. Across Avenue Road on the south side of Bloor Street is the Royal Ontario Museum and to the north, is the Park Hyatt Hotel. Oxford Properties owns the Park Hyatt property with plans to renovate the hotel facing Prince Arthur Avenue while turning the former circa 1929 hotel building facing Bloor Street into a high-end residential rental tower. The entire commercial podium of the Park Hyatt, spanning along Avenue Road, will be expanded and renovated and it will be interesting to see what kind of retailers Oxford Properties will secure for this prominent corner.